Assets are the devices that you support and/or repair for your customers. You can track specific information about these devices, and track a ongoing work history. You can find all of your Assets by clicking on to the Asset Tab or by heading to the Customer Tab > Customer Modules > Assets Managers. Alternatively, you can also view Assets on a Customer's Detail page for a specific customer. (Note: the Asset tab can be moved around or even disabled so don't fret if your Asset tab isn't in the same place). To enable/disable or move the tab to your desired location, head to Admin > Tabs Customization. Navigating around is pretty straight forward. First you need to Create what is referred to as a Asset Type. To do this, head to Admin > Customers > Asset Custom Fields. From there you will be taken to the Asset Types Screen where you can manage your various Asset Types. You can be as specific or generic as you'd like. What I mean is, if you wanted to create a Asset Type for each model of Apple iPhone or Samsung Galaxy device, you could. Asset Custom Fields are where you can choose what data to capture about the device you are servicing. After having created a Asset Type, click the Manage Fields link on the Asset Types page. You will be taken to a page where you can create Custom Fields for that Asset Type. Click New Field to get started. Text Field: Creates a text field to enter data in to if you want. Check Box: Creates check box lines. This allows you to make a checklist for accessories being left with the device for example. Drop Down: You can make field with a Yes/No answer. Think - "Does it Power on?" Yes or No. Web Link: A field that will allow a clickable hyperlink. Text Area: Allows a large text field to dump text data in to it. Date Field: Allows you to choose a date. This is used for Warranty Expiration a lot. Popup: Will create a pop-up when someone visits the Asset Detail page. Scribble: This field allows you to draw things and have it attached to the Asset. This is great for pattern unlocks for instance! There is a Asset creation section in the legacy Ticket Creation screen after you have entered the ticket details. There is a search field that is also a fancy drop down that will display existing Assets. There is also a Create New Asset button that allows you to create a new Asset right there on the page. The Asset Detail page will provide an overview for the Customer's device. You can geet here by clicking on a Device's name from the Customer Detail, The Asset Name on the Assets tab or directly from a Ticket Detail. It will include a work history along with displaying any recorded information. This page can also have Notes added and it is possible to uploads attachments like photos, logs, or documents to have on hand for this device. 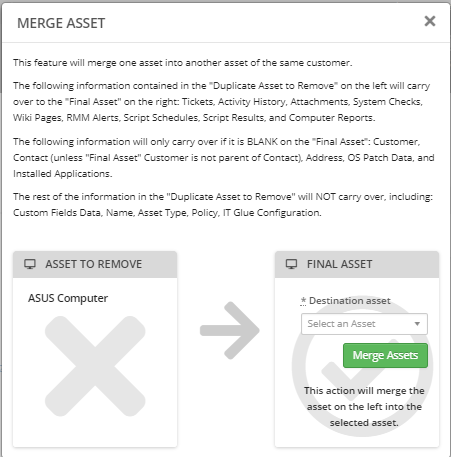 To Merge an Asset record to another, head to the Asset Detail Page, then click Actions > Merge. Next a window will pop up where you can select which Asset you want to Merge to. You can add/create an Asset to a ticket when making a ticket or even after the ticket has been made. It is also possible to have multiple Assets on a ticket if you chose. Asset Lists - Maybe you want to create a list of customers that have a iPhone 6 and offer a special on Screen Repair or Battery replacement. You can do that! Asset Labels - A component of Assets is the labels. Maybe you want to put a sticker on every device that comes in the shop that has the customer's info to keep it from getting lost. Maybe you want to place stickers on the devices you support in client offices to quickly call up prior work on the device. You can do that!